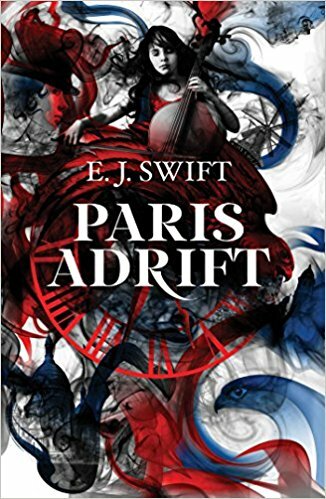 I recently read an ARC of Paris Adrift thanks to NetGalley.com. While reading the first couple pages it was a little touch and go as to whether I was going to stick with it or not. I'm not a big fan of time travel (WAIT - stay with me!). The dystopian part of was only an into and made sense to me only after reading a little longer - and it was worth it. E.J. Swift has written a wonderful novel. It's being billed as "The Time Machine meets Midnight In Paris." Perfect description! this from amazon: "Determined to escape her old life, misfit and student geologist Hallie packs up her life in England and heads to Paris. She falls in with the eclectic expat community as a bartender at the notorious Millie’s, located next to the Moulin Rouge. Here she meets Gabriela, a bartender who guides her through this strange nocturnal world, and begins to find a new family. But Millie’s is not all that it seems: a bird warns Hallie to get her feathers in order, a mysterious woman shows up claiming to be a chronometrist, and Gabriela is inexplicably unable to leave Paris. Then Hallie discovers a time portal located in the keg room. Over the next nine months, irate customers will be the least of her concerns, as she navigates time-faring through the city’s turbulent past and future, falling in love, and coming to terms with her own precarious sense of self." I think it's scheduled to be released in Feb. Add it to your wish list - it's worth the wait. Note: I read an advance electronic copy of this book that I requested and received through NetGalley.com. No review was requested, required, or expected.